Once upon a time, the missus and I would grab a dessert from Starring Rolls, and walk around the corner to grab one of the underutilized tables outside of The Hollywood Brown Derby. When The Hollywood Brown Derby Lounge opened in 2015, we lost our secret stash of tables, but gained a new menu to sample our way through. And sample we did on our most recent trip! Between bites and cocktails, we gave the menu a great first pass. We’ll be visiting this menu a lot over the next couple of months with our reviews, but let’s start off with one of the main bites. One of the first things we agreed we needed to try was the Crispy Bites. I’ll admit that it looks like a variation of the longtime appetizer staple, fried mozzarella sticks. However, there is so much more to this assortment of crispy things. In fact, even just the menu description is more than a mouthful! It lists the Crispy bites as, Parmesan-Goat Cheese Risotto Sticks with Whole-Grain Dijon Mustard Aioli, Brie Cheese with Sweet Onion and Orange Jam, and Blue Affinee-Mushroom Arancini with Fig and Balsamic Dip. That’s a lot to take in, so let’s take it one bite at a time. Let’s take these one at a time, starting with the Parmesan-Goat Cheese Risotto Sticks with Whole-Grain Dijon Mustard Aioli. There is some heft to this artisan cheese stick, which translates to this being a heavy, but delicious, bite. Typically risotto is reserved for a ball type appetizer, but its unconventional usage here works extremely well. Over all, the goat cheese, parmesan, and risotto create a crispy and creamy back-and-forth that is fun to eat. As for the mustard aioli, it has a bite to it which plays well with the stick itself, but is nothing overly fancy. Next up is the Brie Cheese with Sweet Onion and Orange Jam. We love a good brie, and this lived up to expectations. The crispy exterior holds the brie inside nicely, as we were certain it would have melted into a pile of goo before ever having reached the table. Instead it was rich and smooth, better than any mozzarella stick you’ve ever tasted for sure. While there may not be anything particularly special about the brie, it is a fair representation of the cheese. The sweet onion and orange jam on the other hand was terrific. A bit savory, a bit sweet, it was a perfect taste of Florida to me. Last, but certainly not least, is the Blue Affinee-Mushroom Arancini with Fig and Balsamic Dip. These little balls of deliciousness were my personal favroites, but the missus was underwhelmed. The arancini are comprised of rice, mushroom, and creamy blue affinee and then rolled into balls, coated in breadcrumbs, and fried. There is nothing not to like here. The strong blue cheese flavor does not overpower the mushrooms, and is heightened by the sweetness present in the fig of the dip. Add in a bit of the acidity from the balsamic and you have a win, win, win with this bite. Since the trio of dips come with this cone of delicious fried goods, but aren’t already applied to their respective bites, feel free to experiment as you see fit. While I preferred to eat each bite without an accompaniment, the missus thought that everything was better when dunked through the jam first. 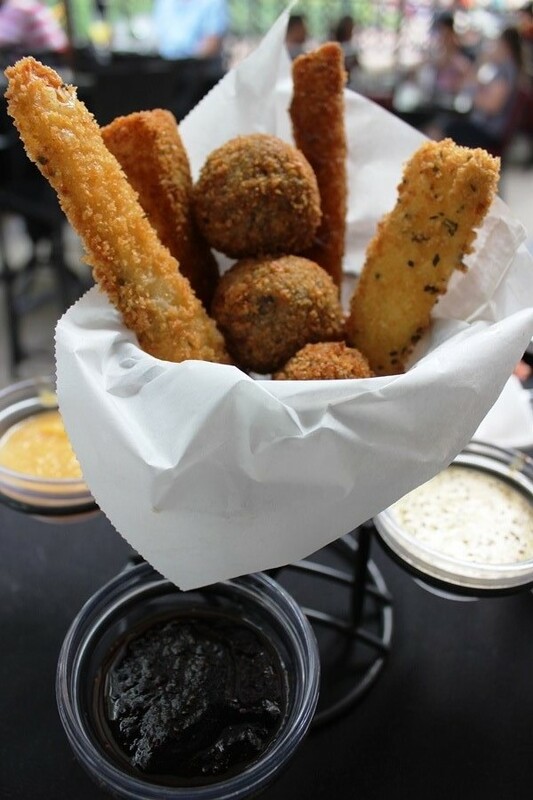 The sticks length and there are more than enough of the arancini so that you can come up with, and enjoy more than a single nibble, of your favorite combination. The Crispy Bites are a great introduction to the Hollywood Brown Derby Lounge, and should definitely be sitting on your table during your next visit!